When I was young, I used to help my mother and my grandmother in their gardens. One of my favourite flowers was the peony and it still is today. I get so excited when the flower buds start to swell that I check them almost daily, looking for the colour that tells me that they’re going to open any day now. Then that day comes when a number of them finally open and my lack of patience is rewarded. I’ll go out and be treated to a number of large showy blooms of pink, red and white. While looking at them, I’ll notice that I’m no longer casting a shadow, a pit will form in my stomach as I look up at the sky, knowing what I’m going to see – rain clouds. Forget doing a rain dance, if you want it to rain, plant peonies. Suddenly the heavens will open up and I’ll run for cover, stealing one last look at the perfect flowers, because I know that when it’s over, every single one of them will be lying on the ground, a little muddy, but still pretty. It’s not their fault. They were bred to be cut flowers, not garden plants, and I’ve learned that it’s better to cut them when they’re showing colour and bring them into the house. 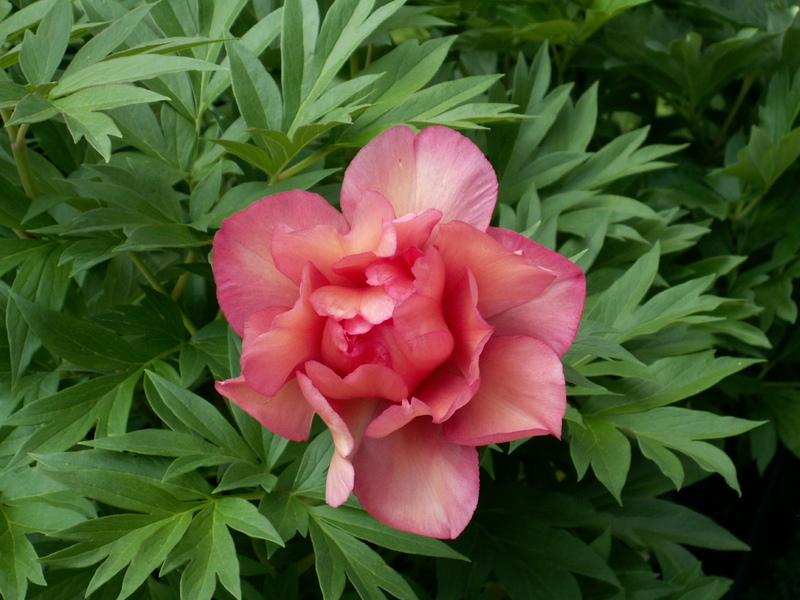 In 1948, Dr. Toichi Itoh of Japan succeeded in crossing a garden peony with a tree peony. After years of development and breeding and selection, Itoh peonies, as they’ve been come to be known, were born. They were very expensive and quite rare at first, fetching thousands of dollars for a small division. 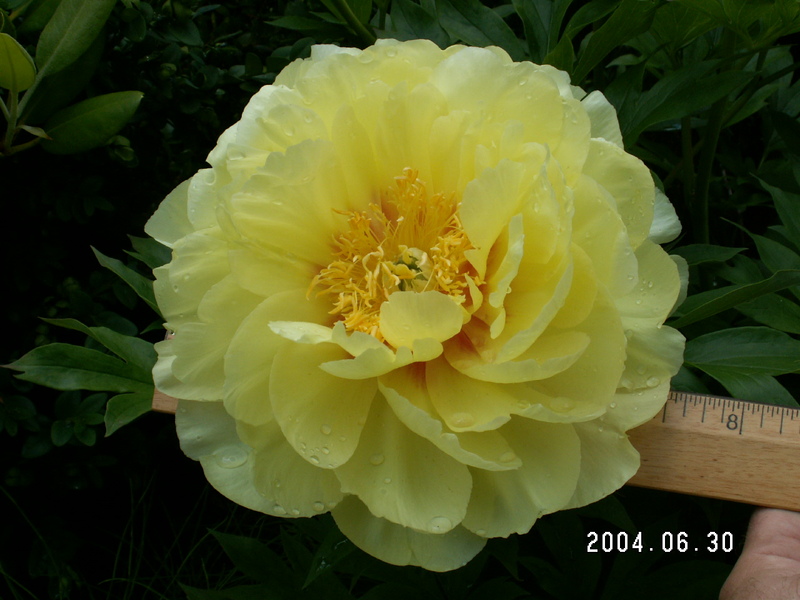 My first Itoh, ‘Bartzella’, a huge bright yellow double peony cost $100 for a small plant that took three years to bloom. That was about ten years ago and the price of them has dropped dramatically. Aside from the uniqueness of the colour (garden peonies didn’t come in yellow), what made me fall in love with the Itoh peonies was the fact that the flower stem was very strong. As much as mother nature tried, those flowers kept standing, and they lasted much longer than my garden peonies. One year, after a heavy hail storm, I went out to survey the damage. The hostas and hydrangeas were shredded. The first flower had opened on Bartzella and there through the middle of the flower was a perfect hole, almost a centimetre in diameter, but the flower was still upright. Five days later and that flower was still going. I was hooked and, of course, added more Itohs to my collection. I now have fourteen varieties planted in various shades of yellow, coral, pink, purple, white, multi-coloured and some that change colour as they age. I also have five waiting to go in, including my first red. I still have my garden peonies and look forward to cutting them to bring into the house, but I no longer worry that it’s going to rain. We need the rain, especially at the moment. 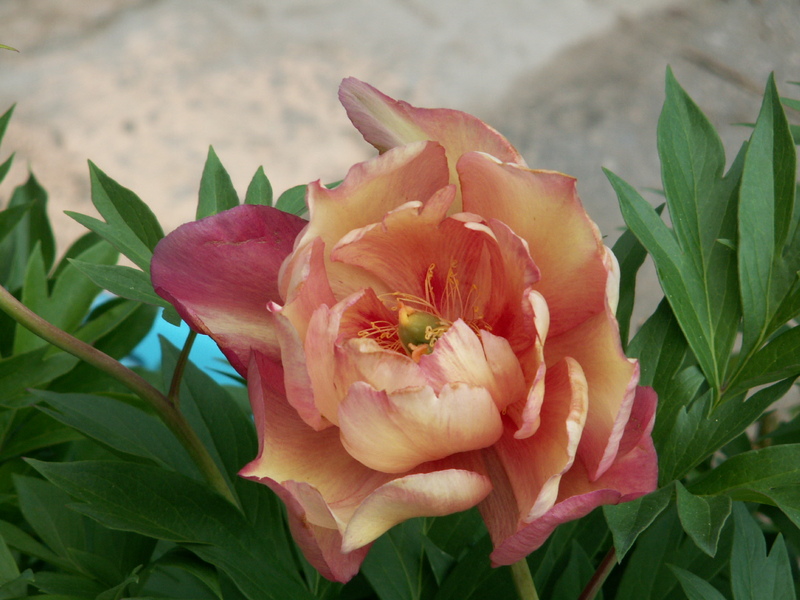 This entry was posted in Columns and tagged Bartzella, Itoh, Julia Rose, Paeonia, peony. Bookmark the permalink. These are beautiful, John. I also love peonies. My grandmother has grown them for as long as I can remember. The yellow is gorgeous, as is the rose-shaped bloom. I’m a fan! Thanks for the column. Very happy to discover this informative website. I bought a tree peony like the Itoh this spring and I would appreciate any tips on what I can do to prepare it for the winter. It depends on whether you bought an Itoh (intersectional) peony or a tree peony. If it’s an Itoh, you don’t need to do anything, other than remove any leaves that might have mildewed to ensure the fungus doesn’t live over the winter in the debris. I try not to cut into the woody stems that will form, as leaves may emerge from these stems next year. If it’s a tree peony, it will depend on your location. If you’re Zone 4 or 5 (Canada) and you get a fair bit of wind, it might be a good idea to put a burlap screen around it for the winter – put three or four stakes around the plant and wrap the stakes with burlap to keep the wind off of the plant. If you’re Zone 4, but protected, you should be ok, but it wouldn’t hurt to do the burlap screen as above just to be safe. If you’re Zone 6 or warmer, you shouldn’t have to do anything. Again, remove any mildewy leaves, being extra careful not to remove any wood. Thanks for taking the time to give me such a detailed response. Unfortunately, the peony that I bought isn’t the one you talked about. I looked up my receipt and it turns out the one I bought is a “Paeonia Suffruticosa Kinshi” Peony. Sorry for making you go through an entire response for the wrong plant. I’m hoping I may impose on your good nature once again and ask if you have any advice on what to do to winterize my peony? I live in Nepean, ON and I make a regular summer trip by Highway 7 to Markham. Next year, I will take a detour to Uxbridge and visit your Garden Centre.